The goals of the society are to promote the interests of elderly in need of medical care, promoting education, training and standards in geriatric medicine for every health care professional, to fight ageism in the health care system and to establish geriatric medicine in every hospital. At the moment most hospitals (>90%) in the Netherlands have a department of geriatric medicine, although in some cases only as an outpatient clinic (including day-clinics) and geriatric consultation. Special interest groups are formed on geriatric oncology, geriatric traumatology, falls and fractures, gerontopharmacology, nutrition, palliative care, and geriatric psychiatry. To contact a special interest group, please send an email. In February is the two days annual scientific meeting “Geriatriedagen”. 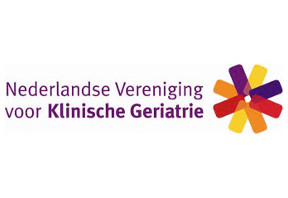 This meeting is organized in collaboration with the Dutch Gerontological Society, the Society of Nurses in Geriatric Medicine, and the Society of Physiotherapists in Geriatric Medicine. Teaching days are organized for the residents in training. There are 8 university hospitals, only one has a full professor in Geriatric Medicine. There is a “special” chair Geriatrics placed within the section family medicine and nursing home medicine in one university hospital, and 3 other university hospitals have chairs in Internal Medicine with special attention for the elderly. CAPHRI-research: public health and primary care. Continuous efforts of the Board of our Society have put elderly care on the political agenda. The number of training positions (which is decided by the government) has been increased from 18 to 31 yearly. The hospital based Safety Management Program includes screening for geriatric giants in every patient above the age of 70 year who is admitted to a hospital. In November 2007 the Undersecretary for Health Care earmarked 30 million Euros for the National Program for the Care of the Elderly. This program aimed to further develop regional programs for the health care for the elderly that cost effectively organize this care for the specific needs of each individual, to coordinate what the different providers in the health care system can offer to the elderly in a coherent way, and to boost research into prevention and improving diagnostic tools for health problems in the elderly.